Paul Reed, President of the Meigs County Community Improvement Corporation, accepts the award on behalf of Meigs County for excellence in marketing and communications in 2018 from the Ohio Economic Development Association. 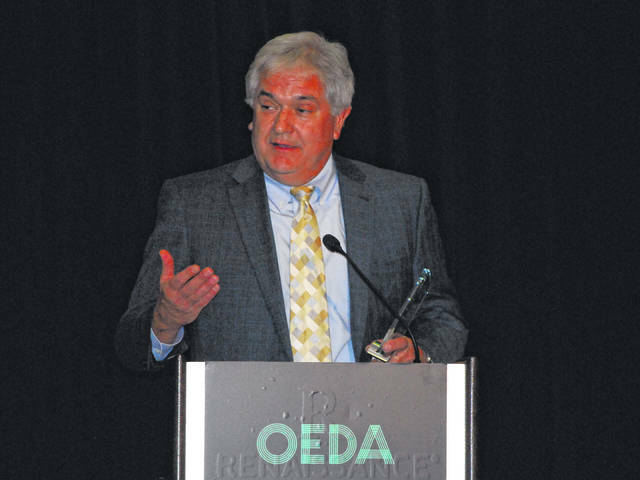 COLUMBUS — The Ohio Economic Development Association (OEDA) presented its Annual Excellence Awards at its 2018 Annual Summit, held at the Columbus Renaissance Downtown earlier this month. The Ohio Economic Development Association’s Annual Excellence Awards program recognizes the achievements of individuals and organizations throughout Ohio in the areas of economic and workforce development. “The Annual Excellence Awards showcase the best of the best in economic development and gives members of the profession the opportunity to come together and collectively celebrate the success of the economic development profession,” Jennifer Price, OEDA Executive Director, said. The Marketing & Communications Award recognizes successful economic development marketing projects or marketing campaigns. The Excellence in Marketing & Communications Award for a Small Community (under 50,000 population) was awarded to the Meigs County Economic Development Website. The Ohio Economic Development Association is the professional association for economic developers. The association’s mission is to increase economic prosperity in the State of Ohio by working together, on a non-partisan basis, with state, regional, and local development partners to advance Ohio’s economy through professional development, advocacy, and networking. For more information about OEDA, please visit www.ohioeda.com. https://www.mydailysentinel.com/wp-content/uploads/sites/14/2018/10/web1_10.24-Economic-Development_ne20181023133412610.jpgPaul Reed, President of the Meigs County Community Improvement Corporation, accepts the award on behalf of Meigs County for excellence in marketing and communications in 2018 from the Ohio Economic Development Association.